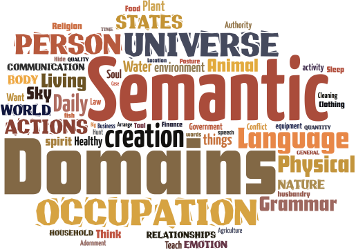 This website contains a list of nearly 1800 semantic domains. They are organized in a hierarchy under nine major headings so that similar domains can be found together. The list of domains was developed by Ron Moe, a linguist working with SIL International, as a tool for collecting the words of a language and developing a dictionary. But researchers have been finding other uses for the list. a short list of English words under each question that belong to the domain. You may freely use this list of domains and adapt it for your needs according to the Creative Commons Attribution-ShareAlike license. The list is intended to be used for any language in the world, but is currently based primarily on English. Research has been done on the domains of other languages and the results of the research has influenced this list. It is hoped that further research will enable this list to become more global.